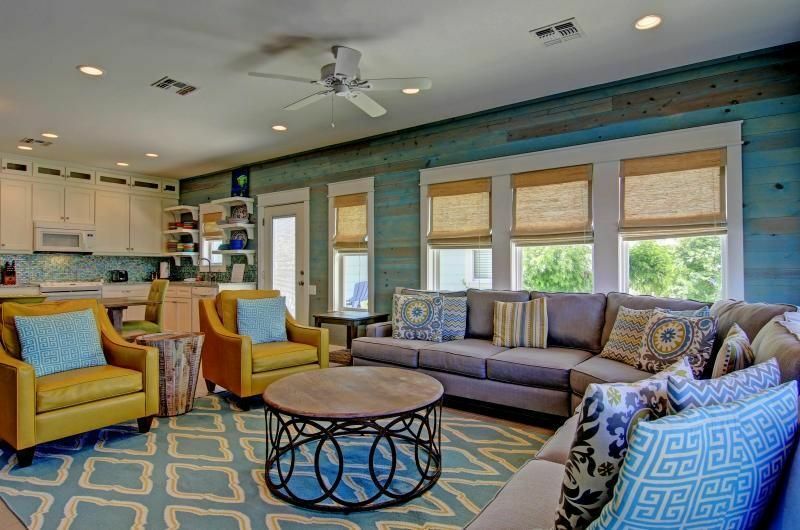 Newly constructed, professionally decorated 4 bedroom 2.5 bath home overlooks the community pool and is close to the beach and all the shops and restaurants of Port Aransas. La Playa’s famous guacamole and margaritas are just few blocks away! Guests love the incredibly comfortable beds, custom tiled bathrooms featuring Italian marble, and flat screen TV’s with DirectTV (including NFL Sunday Ticket during football season!) in all the bedrooms and living room. Don’t feel like going out? The chef’s kitchen is well equipped with everything needed to cook at home, including extras like organic herbs and spices, and specialty sea salts. This great floor plan features the master bedroom and bath downstairs, with all other bedrooms up. Master: King bed and full bath with a new multi shower head. Guest rooms: 1 Queen bedroom (upstairs), 1 king bedroom (upstairs) and an awesome bunk room with 2 sets of twin bunk beds and a futon. All bedrooms feature black out shades, perfect for nap time while on vacation.This fabulous Island cottage offers a wonderful beachy décor, a community pool right outside the door, a charcoal BBQ grill, and an open-air outdoor shower. Pura Vida is powered by 100% renewable energy, and stocked with all natural, chemical free hand soaps and household products. Who says beach living can’t be luxurious, comfortable, AND earth-friendly? Come, Relax and Enjoy this island treasure! No overflow parking. 3 parking spaces provided for this property in driveway. NO boat parking here. This home is NOT pet friendly. Nice open concept, decor looks great! Property needs a good cleaning - opened a drawer & a roach was running around & roach droppings in drawers! Kitchen cabinets/drawers all need to be organized!! Guests commented that the upstairs bathroom wasn't all that clean! Master Bathroom - Shower sprayer worked the first time & then we couldn't get it to work - only the large overhead rain shower worked? We planned on cooking on the grill, but after seeing them - No Way! Disappointed about the pool area & size. Positive note: Loved the large dining table/benches & living area to gather in! Guys were happy that there was Direct TV, so they could watch the Houston Astros! Room with bunk beds was perfect for the granddaughters - great setup! I think there should be a large rug on the floor when you enter the home - we had to lay a towel down to wipe our feet! Parking 3 vehicles gets very tight - along with the golf cart! Thank you for the feedback. I am so sorry to hear you had a bug issue, if the management company was notified during your stay we would have sent pest control and housekeeping over right away. The houses are sprayed quarterly with a pest control company but resprays are sometimes needed as we have many bugs living on an island. We have organized all the drawers and cabinets and cleaned them out as well. The grill is a neighborhood grill so we have notified the HOA. We hope you will come back and stay at Pura Vida since you loved the layout. There were 3 families and we are all friends. Each was 2 parents and 2 kids. This worked as there was a kid bunk room that could fit 6 kids and each adult couple had their own room. There is a master suite on the bottom floor and the rest are upstairs. Every room has a TV which is nice if you are the type that likes few minutes right before bed. The main level has a powder room bath for all and the open floor plan and giant dining table made this so relaxing and easy for us. We cooked most of the time and saved so much time and money. The pool in the back is nearly private as we were the only ones in it all weekend. It is a little shallow so smaller kids that might be just okay swimmers are fine in it (with adults of course). There are grills and a cabana and we used every amenity! What a blast in this well decorated, clean home. We will look to book there again if all is okay after the hurricane. Prayers for all those in the area as we love that part of the state and frequent Port A often. Rented a golf cart, loved being in town! We plan to stay here again in the future. Clean, comfortable, close to the beach! Would definitely recommend! Graet house, close to the ocean, will return! This house had everything that we needed! Friendly staff, we will definitely return! Beautiful,big and completely furnished.Close to everything.Had a great time!Only problem was limited parking spaces. Thank you for the nice review. We are happy to hear that you had a great stay. We apologize that the parking was limited for your party. Please consider staying with us in the future. Thank you from Port A Beach House Company staff! Let me start off by saying, "wow!" This was the perfect spot to relax, be with friends and family and have a great time. I can't wait for the next time I come back here. Besos!